Brick-wall #1 – You trip to the local home center store to ‘pick up some panels’ didn’t turn out as planned. All they stock are cheap ‘plasticky’ looking things you wouldn’t be caught dead with. Brick wall #2 – You find the coolest bathroom wall panels EVER (need to say this in your best ‘Valley-girl’ voice), only to find out they’re only available in the U.K – unless you want to buy a container of them. But you’re not quite sure how the container is going to fit on your lawn and if you’re going to be able to sell your entire neighborhood these panels as well! Brick wall #3 – You’ve got your credit card in hand and are looking to DIY this project. You make call after call and nobody will take your money. They will not sell you the panels. No – they will only supply and install the panels for you. You can’t afford professional installation, and besides, you’re comfortable doing it yourself. Brick wall #4 – It takes an act of God to get samples. How can you make this decision if you can’t see, touch and feel the product? You don’t want to spend your hard-earned dollars on junk. Sure, they look beautiful on the ‘net. The challenge becomes what are you going to do if they are as flimsy as a house of cards after you take the shipment and the driver is long gone? Brick wall #5 – Trying to find special sizes and pair them with a custom sized shower pan is as hard as getting Republicans and Democrats to agree on ANYTHING. Can you recognize any of these brick walls in your search efforts thus far? My goal in this article is to give you tips and strategies to blow past these challenges and successfully purchase the best bathroom wall panels for you. I’ll get you – quickly and efficiently – past these hurdles with 5 practical tips whether you want to do it yourself or have them professionally installed. 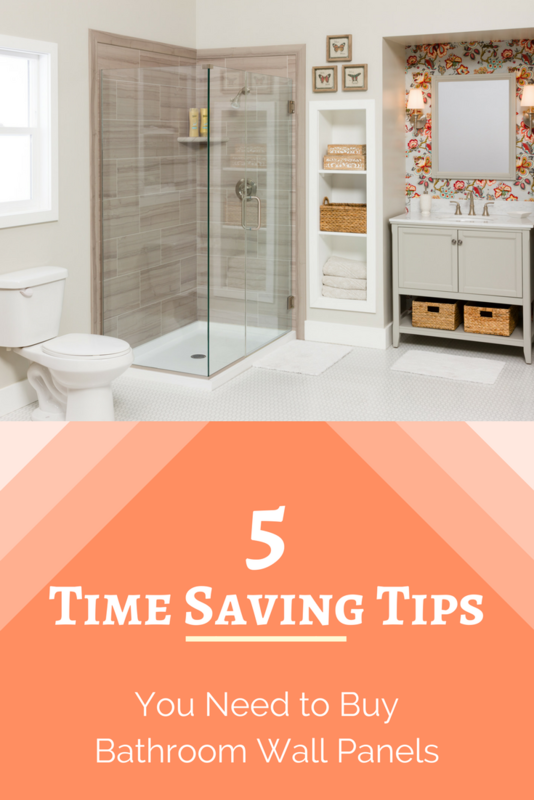 Let’s check out these tips so you can throw out your tile scrub brush, get rid of your tile and not get stuck settling on generic-looking white plastic panels from your local home center store. Tip #1 – Just because it’s on the ‘Net,’ don’t assume it’s something you can get. Check availability before you waste your time. The Internet is great when it exposes you and I to wonderful product ideas. The Internet also can be the greatest tease when it exposes you and I to wonderful product ideas we can’t cost-effectively source in the United States. The problem with the wall panel market is it’s far more advanced in Europe and Asia than in the United States. I was talking to a manufacturer in Norway at the 2018 International Builders Show and he blew my mind when he said, “Mike, over 50% of the showers in Norway use wall panels. They are more popular than tile.” In the United States we are behind the 8-ball introducing wall panels. So, what does this mean for you? You’ll do Internet research. You’ll find cool stuff. You’ll find some products aren’t available in the United States. How do you eliminate getting taunted by the Internet with product you can’t get? When you check out a cool line immediately go to the “Contact us” or “About us” pages on the site. If you see weird phone numbers (ones which don’t have 10 digits like you see in the United States), before getting your hopes up send an email to this company and see if they have any U.S. distribution. If they don’t answer you, or have no distribution, blow them up and move on. What’s neat about these laminated wall panels from Norway is we got such an overwhelmingly positive result about them we have become the United States distributor for this cool product! Tip #2 – Try to find a showroom – or insist on getting your paws on samples. I’m no Latin scholar (and I’m sure those of you who’ve been reading my posts have figured this out already), but the one Latin phrase I do remember from my business-school days is ‘caveat emptor’ (which translated means, let the buyer beware). Pretty pictures on the ‘Net’ are just that. Pretty pictures. These images – may be graphically enhanced (hey-wouldn’t it be cool if we could graphically enhance ourselves also? 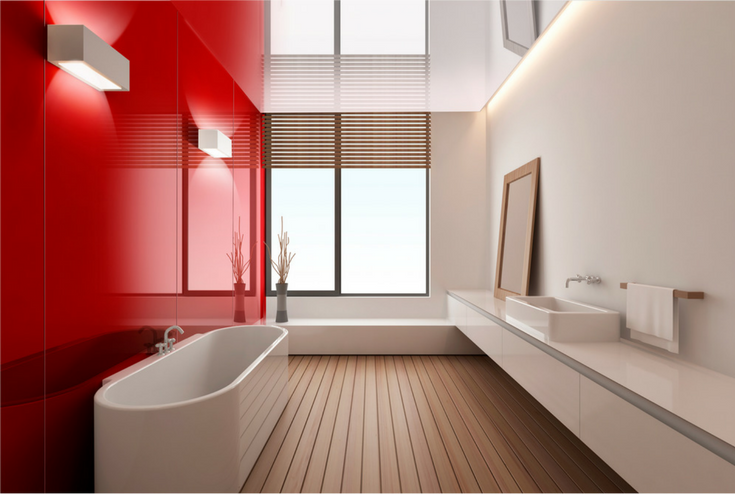 – but I digress) or renderings, won’t necessarily look as sharp once you install them in your bathroom. 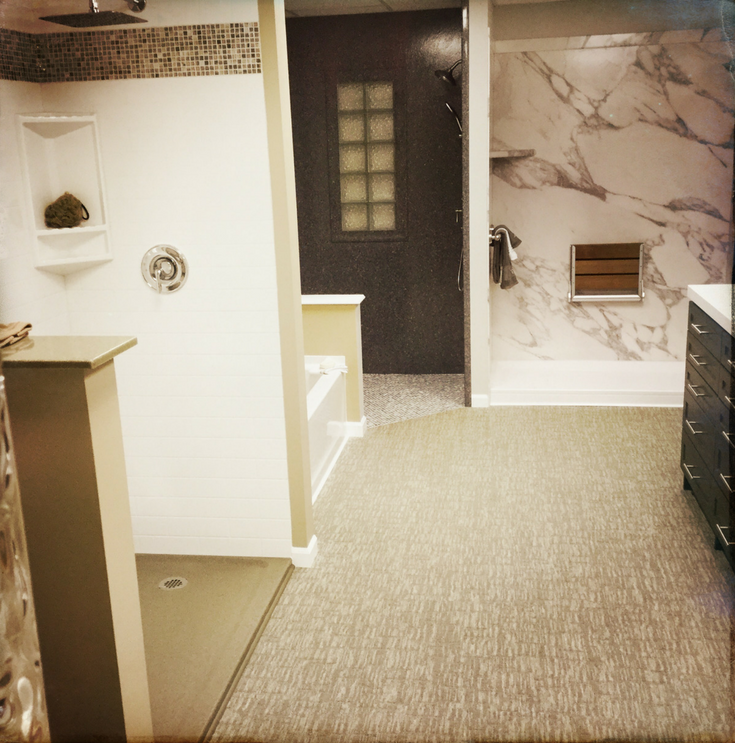 In the perfect world (yes – this is not the world ANY of us live in today) go to a local showroom to see, touch and learn more about the bathroom wall panels you THINK are the best (your opinion might change once you experience them up close and personal). If you can’t find a local showroom (this is likely), ask for samples. If your potential supplier either won’t, or can’t, get their act together enough to send you samples, move on to your next option. You’ve heard the well-worn statement you can’t fit a square peg in a round hole. When it comes to wall panels you usually can’t fit a standard bathroom wall panel kit into a custom sized shower or tub opening. Before you get excited about a wall panel selection measure your space to see what size or sizes you need. If your desired panels only come in standard sizes this is not the end of the world. Ask how they are cut. Determine what tools you need to drill, cut or trim the edges. There are some systems (solid surface showers are one example), where you can get custom sized (pre-cut) wall panels and matching shower pans so you don’t have to sweat fitting your ‘trapezoidal peg’ (weird sized shower) into a ‘standard size wall panel’ hole. Measure first. Research what you want to buy second. Don’t look for panels before you know what sizes (and what size shower pan for that matter) you need. If you can get custom sized, precut panels this is the ultimate. If not – make sure you know how (and have the tools) to cut standard sized panels for your weird-sized shower or tub. I don’t know how many tricks a pony can do (I’m just smart enough to know how to spell equestrian because I’ve used my fancy spell-checker), but I know when it comes to business, buying from a ‘one trick pony’ (a company who only sells one product) is dangerous. It can be dangerous to your pocketbook. It can be dangerous to the finished result. Who really wants a high-pressure pitch from a one product pony? I certainly don’t. If possible, look for installation companies or material suppliers, who offer multiple lines of wall panels. If they’re any good, they’ll ask good questions to figure out which line(s) are the right solution for your project. Here’s a truth (IMHO) which applies to wall panels. Bottom line – don’t buy from a one trick (‘er bathroom wall panel) pony. Everything is easy-peasy-lemon-squeezy…. until…. you go to do it yourself (or you buy from an overzealous un-reputable contractor to do it for you). I can attest to this as I remember the first time I ‘tried’ to spread mortar onto a concrete block as a pimply-faced 19-year-old working for my Dad’s mason contracting company. My mortar joint looked nothing like the experienced masons. It may seem like a good idea to buy cheap bathroom wall panels from your local home center store, until you can’t figure out how they are installed. Then (after driving back down to the store) you can’t even find the guy in the orange smock who originally ‘helped’ you get the panels off the shelf. It may seem like a good idea to buy from a cut-rate wholesale panel supplier, until you need technical insights and during a ‘dazed-and-confused’ phone conversation they give you the 800 number of the manufacturer. They punt YOUR PROBLEM to the manufacturer. The manufacturers customer service reps don’t usually work with installation problems. They are equally useless. A good product, poorly installed = A bad product. 1) Does your supply company also install bathroom wall panels? People who have a contracting side to their business, better understand the installation process (and tiny tricks and tips to make the job go smoother). 2) What installation support materials do you have? Are there written instructions and videos? Let’s face it, most of us HATE to read instructions. Videos are better and take less time to figure out. If there is no installation support, you must abort. 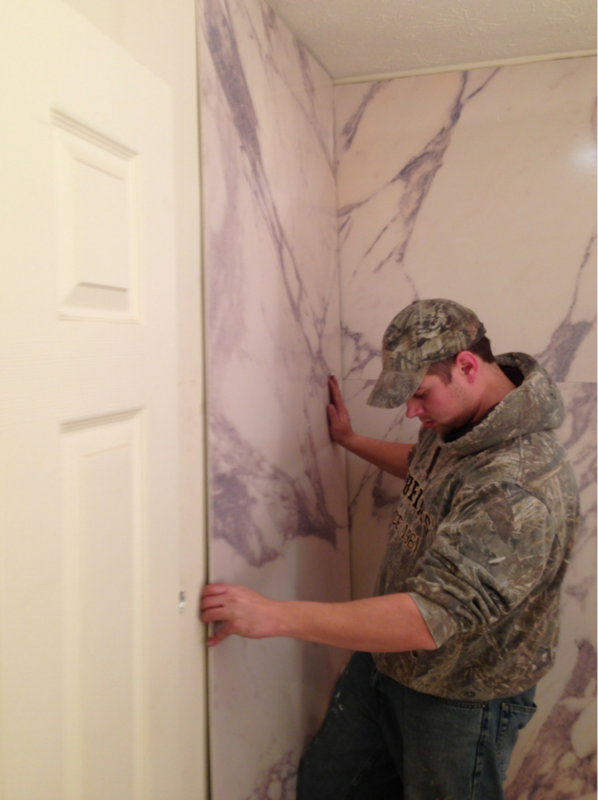 While it should be simple to buy bathroom wall panels, it often isn’t. If you don’t want to get stuck with the maintenance hassles of another tile job, or end up by default buying a cheap, plastic wall panel system, remember these tips. First, make sure you can actually source the panels, touch them, and they will fit your shower or tub space. Second, make sure you’re not dealing with a supplier who will try to jamb their single product solution down your throat (you don’t need a one trick pony). Finally, make sure (even if you think you’re up to doing your own install), you’ve got installation support (or contractor expertise) to get a quality finished project. If bathroom wall panel research and choices are blowing your mind, we’re here to help. If you’re looking for nationwide supply of 3 different lines of wall panels call us Innovate Building Solutions at 877-668-5888. If you’d like to visit a showroom to see, touch and feel these panels, stop at 4566 East 71st in Cleveland Ohio. 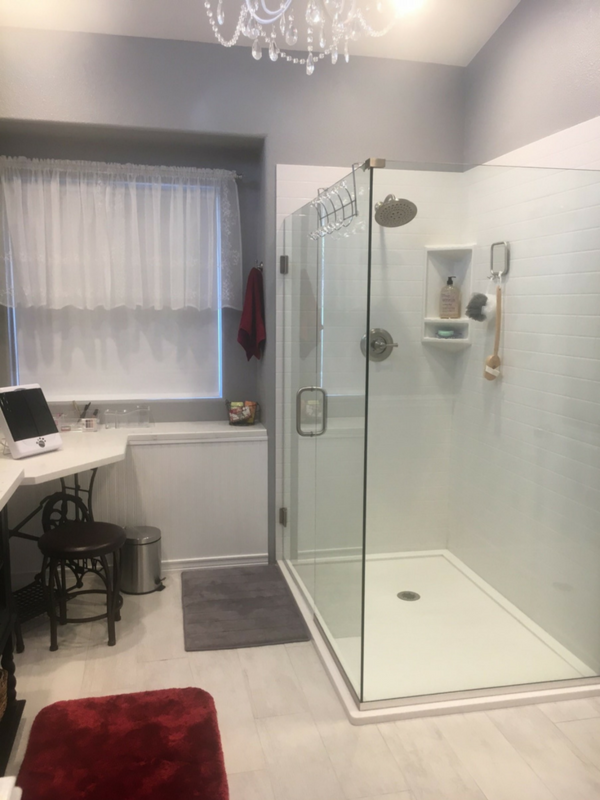 If you’d like to hire a professional bathroom wall panel contractor, contact The Bath Doctor in Cleveland at 216-658-1270 or in Columbus at 614-252-7294.